Paintings in the Santa Maria Gloriosa. A visit to the Frari in Venice has been a long-standing ambition of mine, I missed the opportunity to see the magnificent artwork in this church on a previous visit to the city, an omission that had haunted me for several years. My ambition was finally realised in June 2013. The followers of St Francis of Assisi, The Friars Minor, founded the church in 1225. Dedicated to the Virgin Mary the S. Maria dei Frari became known locally as simply the Frari. To see works of art placed in their intended location is a rare treat and the Frari houses two of Titian’s finest paintings The Assumption and the Pesaro Madonna. 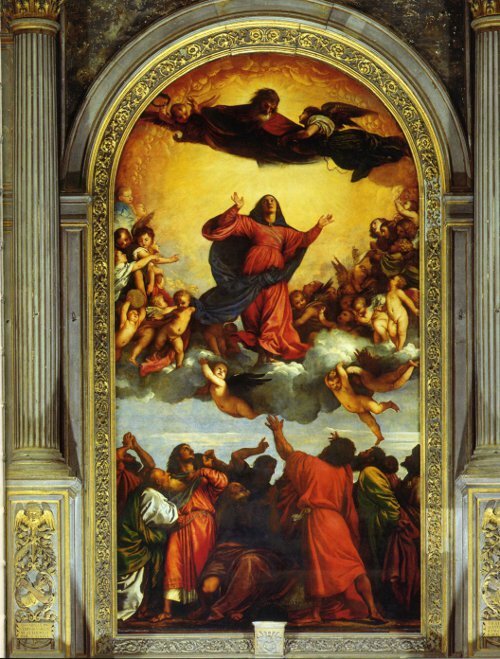 The Assumption is rightly considered to be one of Titian’s greatest masterpieces, it is a wonder of light and colour. The light, a golden glow surrounding the Virgin’s ascent into heaven, dominates the top part of the painting as the Eternal Father gazes down ready to receive her. The Madonna is supported on a cloud of angels and below this central scene, the blue of the sky fills the space between the ascending Virgin and the disciples below. Here the apostles assemble stunned by the miraculous vision that they are witnessing. St Andrew reaches upwards, arms outstretched. St Peter kneels with his hand on his breast and St Thomas points at the Virgin. 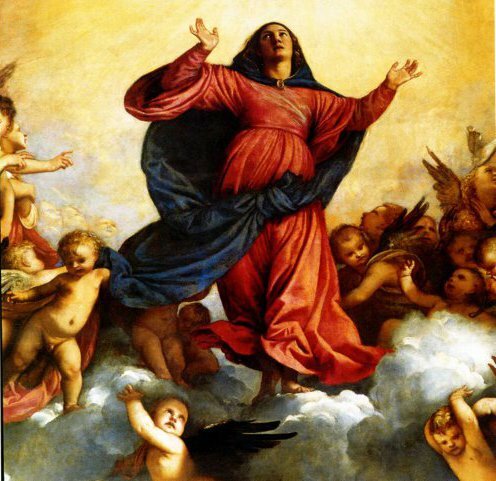 The Father figure, the Virgin and the apostles effectively split the composition into three separate orders harmonised by a triangle of reds that lead the eye upwards to the main event, The Assumption. Titian has been hailed as the master of colour, this painting is a perfect illustration of his rendering of paint. The artist has produced one of the greatest works of all time, to view the painting in situ is a magical, unforgettable experience. The colour combinations of red, blue and bright yellow highlight the artist's skill and control over his chosen medium. The youth, Antonio’s son Leonardo, seems to be observing us the viewer from the confines of a work painted centuries ago! It is an unnerving experience to consider the thoughts of this boy, captured and fixed in time. What does he make of the endless procession that have gazed upon his features? He is forever trapped within the painting, made immortal by the skill of the artist and it is thanks to Titian’s genius that he appears to be so... alive! 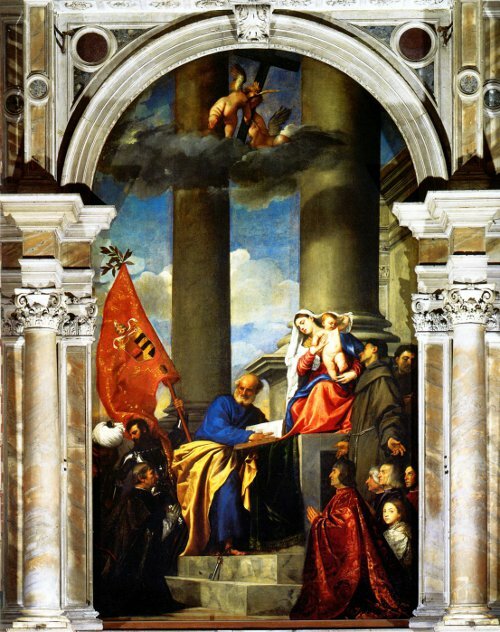 The painting is unusual because of Titian’s innovation that removed the Virgin and Child from the centre of the composition placing the principal figures to one side. Despite this, there can be no doubt that these figures command the apex of the geometrical pyramid within the painting. St Peter sits below and to the right of the Virgin and is clad in striking blue and yellow robes. Jacopo Pesaro kneels before Peter waiting to be received, behind him a standard-bearer raises the banner of Pope Alexander VI. 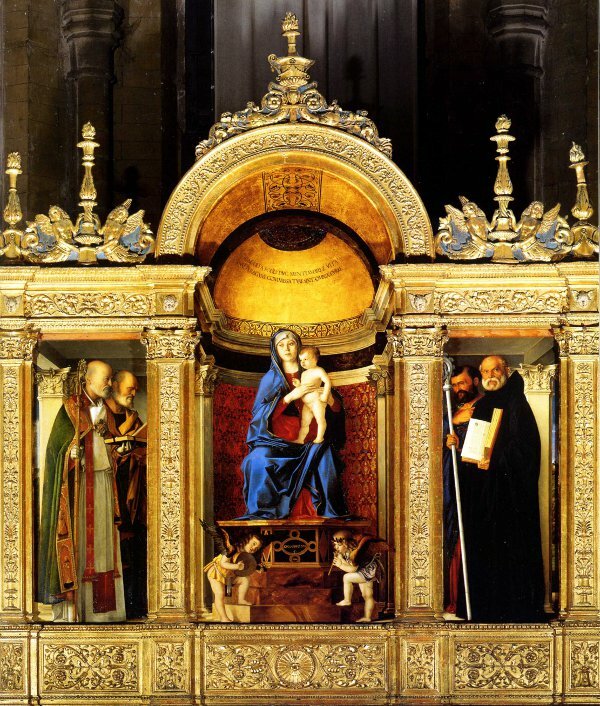 On the left of the Virgin’s throne are the Saints’ Francis and Anthony. 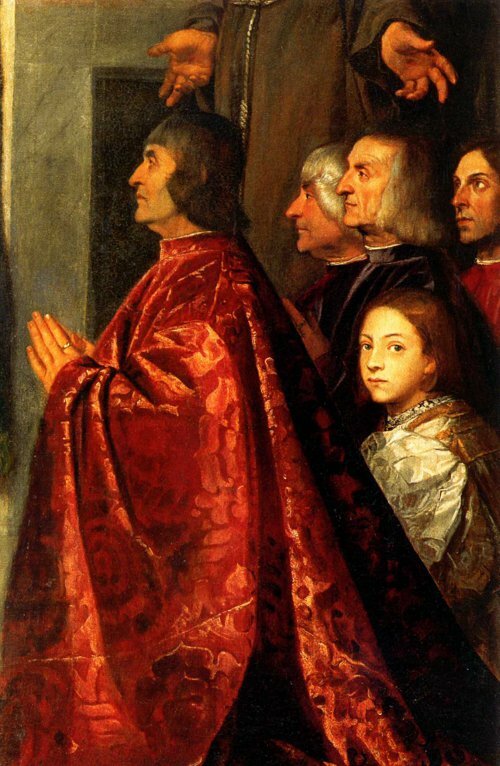 At the foot of the throne are Jacopo’s brothers, Francesco, kneeling in scarlet, Antonio, Giovanni and Fantino. Antonio’s son Leonardo, dressed in white satin gazes out of the painting his distraction expertly captured by the artist. At the very top of the painting two angels ride on a cloud as they straighten a cross symbolizing God’s support for the Christian faith. The Frari is home to many more works of art and Donatello’s St John the Baptist is just one example of many. This is the only statue by Donatello still left in Venice. 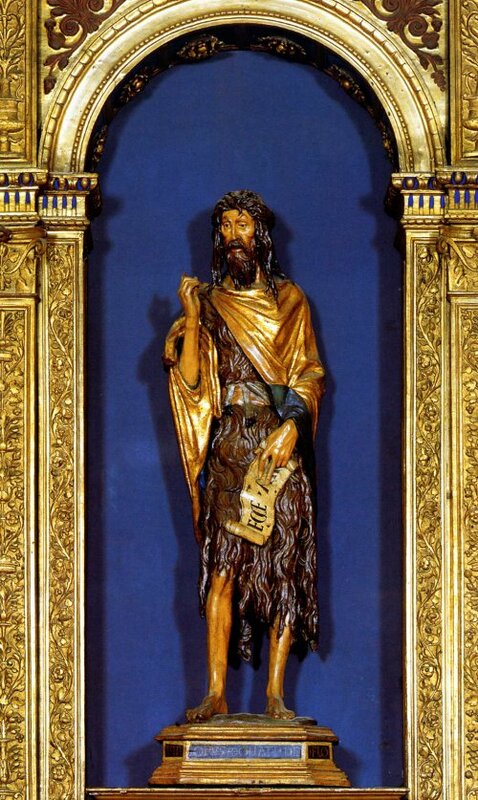 St John is dressed in a shaggy hide covered by a mantle thrown over his shoulders. This wooden statue was restored in 1973 revealing the artist’s signature with a date of 1438. Despite the many over-paintings the restored work retains all the power of expression intended by the artist in both the face and arm movement. This is on one of Bellini’s finest works, it is signed and dated Joannes Bellinus 1488. In the centre, the Virgin is seated on a throne holding the baby Jesus in her arms. The three-dimensional effect created by Bellini is astonishing, the Virgin appears to be almost detached from the background. On either side are wonderful pictures of saints. On the left are St Peter and St Nicholas and on the right are St Mark and St Benedict with his open book and long black cloak. Beneath the feet of the Virgin two angels play music, one holds a flute the other a lute. The golden frame surrounding the work was designed by the artist himself a true testament to one of the greatest masters of Venetian art. 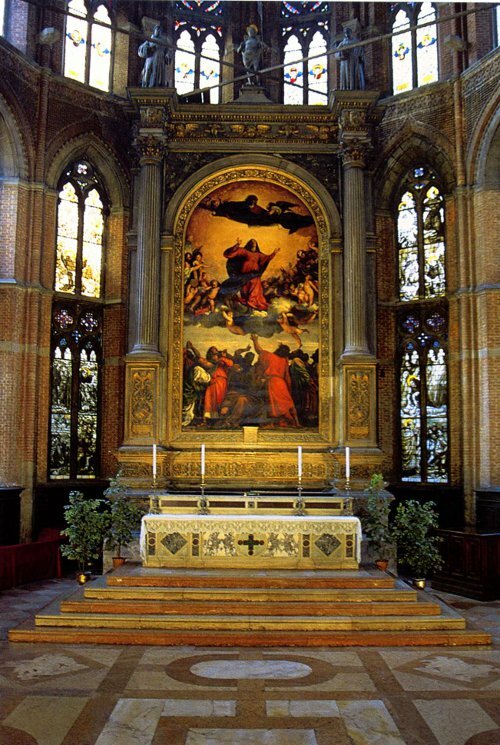 A view of the High Altar featuring Titian’s Assumption as the centre-piece. The altar was consecrated on 13 February 1469.